Quite a few of our Tot School photos this week show a certain little man wearing the same pair of zippie pjs. And while I promise that we do wash them, it is growing increasingly difficult to get him to take them off. He loves them. And by loves them, I mean kicking, screaming and crying should we even hint at taking them off. Kaleb has been playing quite a bit with our Leap Frog Fridge Phonics game, so we are hearing the ABC song repeated all.the.time. And it's sinking in because he is singing along sections of the song and even doing bits by himself as he walk around the house. 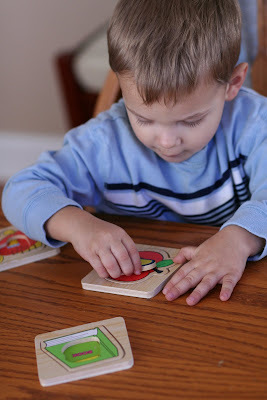 Thanks to Carissa for mentioning the puzzles she found at Ross last week! I went the next day and despite the fact that the toy section looked like a tornado had gone through, I found ONE set of the alphabet puzzles that she had gotten. And Kaleb is loving them! 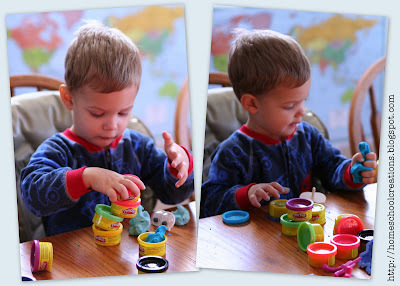 Kaleb got some mini playdough containers for Christmas and he loved trying to stack them. He also loved trying to eat the playdough (nothing new), but loves all the little toys that we have to stick in our playdough too. 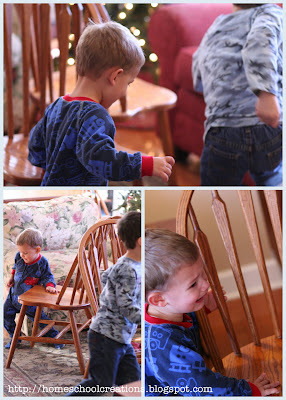 Everyone got a little energy out playing musical chairs together. Which resulted in much crying every time the music was turned off. 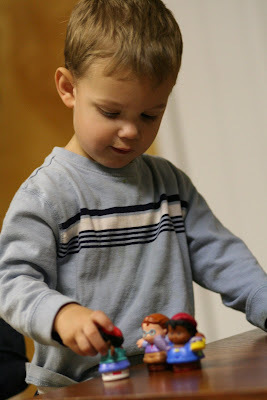 And Kaleb and I had fun playing with some of our Little People and attempting to count - but apparently he just likes to listen and won't count along anymore. And the biggest hit of all this week was being able to play along on the wii Outdoor Challenge mat with the big kids. He needed a little help, but it was so much fun to watch him! 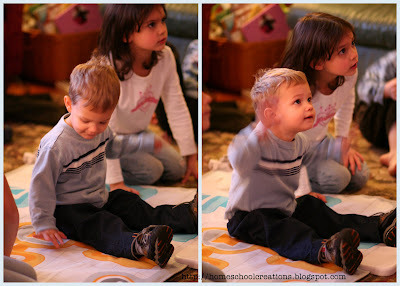 Don't forget to head over to 1+1+1=1 for some more Tot School Posts! Have a great week!